As I run/race/train these days, I can honestly say that I, as a race director, I am probably more focused on what I'm seeing and experiencing than on being a really competitive runner. I’m looking at everything — start, course, water stations, timing mats, clocks, crowd control, finish area — the list is endless. I’m constantly looking for any new and innovative ideas. I notice the good, the bad, and sometimes the ugly. One thing I have really started noticing is the crowding around water stations. In particular, the thing that concerns me the most is when runners reach for a cup of water, grab it, and then come to dead stop or a slow walk while they drink from the cup. Why do they have to stop to drink? Of course, runners like me who are in a rush (it is a timed event!) grab our cup, squeeze it, drink from it, and toss it, all while continuing to run… well, that is, until we slam into the back of one of these aforementioned runners who came to a dead stop right in front of us! Who said running isn't a contact sport?! The runner who has stopped or started walking may not care (or realize it's a possibility) if they get hit from the rear, but the runner who wants to continue to run (like me) is most likely not too interested in tripping up and doing a face plant on the road. As one who always wants to improve, I started thinking about creative ways where we all can co-exist. If, after every water table a rope and stanchion water station “drink zone” was set up, a runner could grab a cup, enter the zone, stop or walk, drink from the cup, toss it, and then run out of the zone back onto the race course. Anyone not wanting to stop or walk would simply continue running straight ahead. Strong messaging/signage would indicate “DRINK ZONE ON RIGHT/LEFT” with an arrow pointing where to go. The drink zone concept should be aggressively communicated in all the race printed material, on the race’s website, in runner email blasts, and by the race announcer at the start of the race. The volunteers who are working the water stations should also police this and direct runners who look like they are about to stop or walk into the drink zone. This is not a “one size fits all” solution. It's just a concept to get us all thinking as to how to address the near mayhem around waters stations in our races. This certainly needs more tweaking. Perhaps some of you have even better ideas (feel free to reach out on Facebook or Twitter, or email us at info@dmsesports.com). 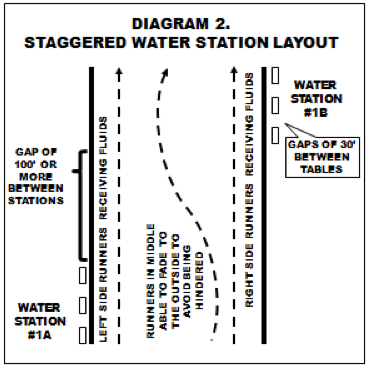 One other idea we’ve used to minimize congestion at water stations that have tables on both sides of the street is to stagger the table set-up when placing on both sides of the street. If you are placing, say, five tables on one side and five on the other side, the idea is to place a linear row of tables on one side first followed by a reasonable gap and then a linear row of tables on the other side of the road. Spacing between tables should be at least 30 feet. Once again, you need to repeatedly communicate this to all the race participants so they know to stay on one side of the road or the other, as there would be no need to ever cross to the other side. Those on the side of the road where the tables come later need to know in advance or even see them and not think that if they pass the tables that are on the other side that they may not get water at all at that station. If you are consistent from one station to another, then eventually the runners will get it and will figure out the routine. This definitely helps relieve the congestion and back-up at water stations, especially those that are located on narrow roads. As we all know, one of the worst things that can happen in a race is for you to run out of water. However, almost as bad is for runners to be unable to easily access the water at a station even if there is plenty to go around. Perhaps these simple tips can help alleviate those issues from ever occurring in your race. However, they're only tips. You have to decide what works best for your event. Newer PostCOURSE CLOCKS: ARE THEY NEEDED ANY MORE?